If you need instructions or more detailed information about the Bria phone, check out Bria’s Technical Support page. Click the Softphone tab at the top of the Bria Phone and select Account Settings. 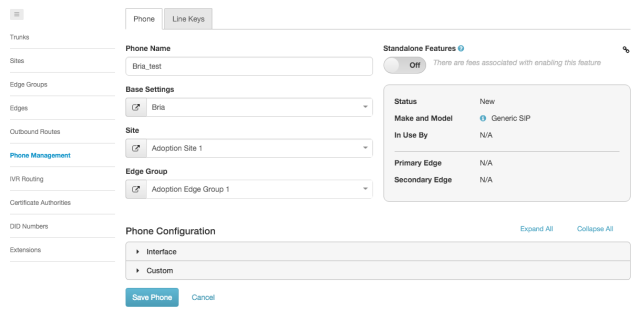 This section is utilized when creating the phone in PureCloud. 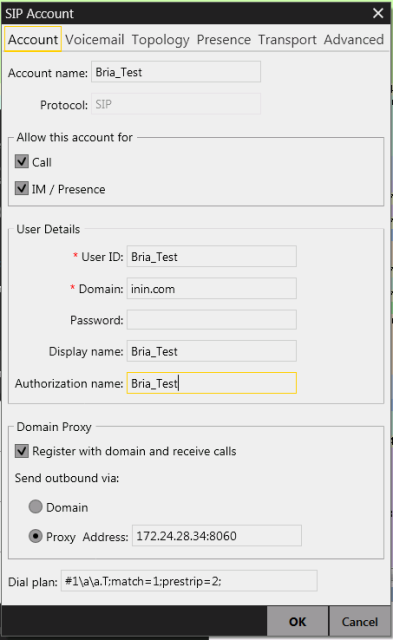 In the Domain Proxy panel, select the Register with domain and receive calls check box. Example: If the computer that has the Bria phone is within the same LAN/WAN your Edges live within, you use the Internal IP address of the Edge. Example: If the computer that has the Bria phone is a remote user not on the same network or not utilizing a VPN to your WAN, you are required to connect to the Public IP Address of the Edge. In this case, you will also need to utilize a STUN Server > setting, which can be configured under the Topology Tab. 携帯電話を作るとモデル] ドロップ ダウン リストから選択します。 汎用の SIP 電話機.